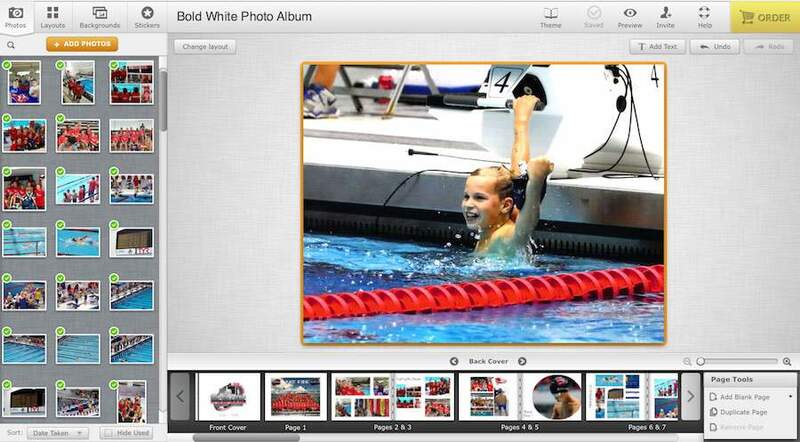 Digital photo books are such an awesome way to relive special events and memories. I’ve shared before how I use them to celebrate family vacations and organize my kids’ art work. Today, I want to talk about yet another way that we use digital photo books in our family. 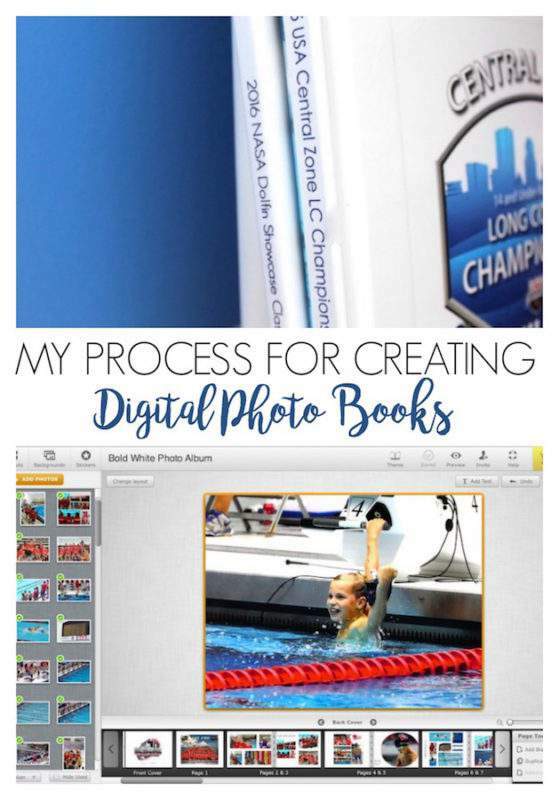 I’m also sharing my step-by-step process for how to make a digital photo book, in order to encourage you to take the plunge if you’ve never created one before. Both of my kiddos are competitive swimmers (you may remember all of my challenges with swim ribbon and swim medal clutter I shared awhile back). 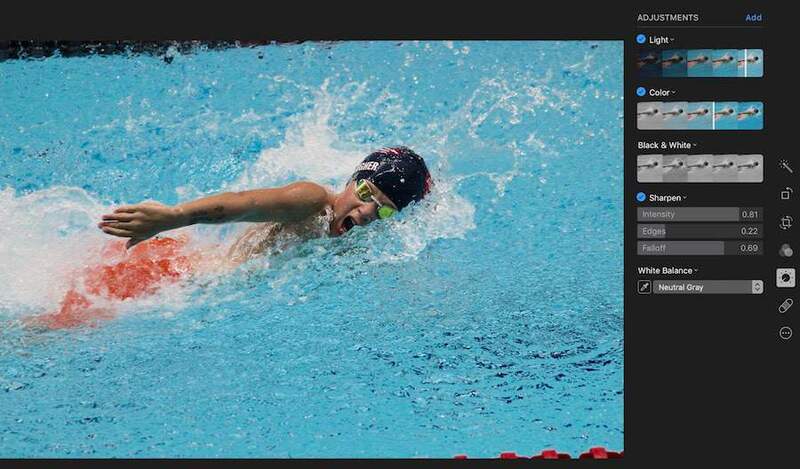 Over the past few years, my son Alex has had the opportunity to qualify and swim at some awesome regional- and national-level swim meets. 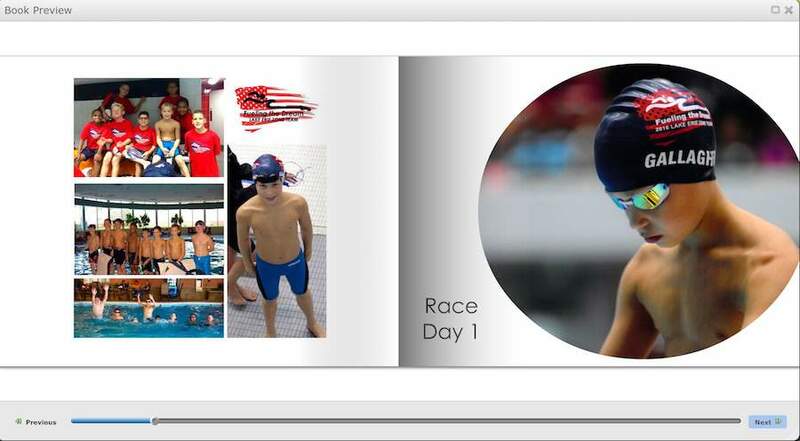 I’ve started a tradition of creating digital photo books each year for his birthday to celebrate these milestone achievements in his “swim career” for that particular year. 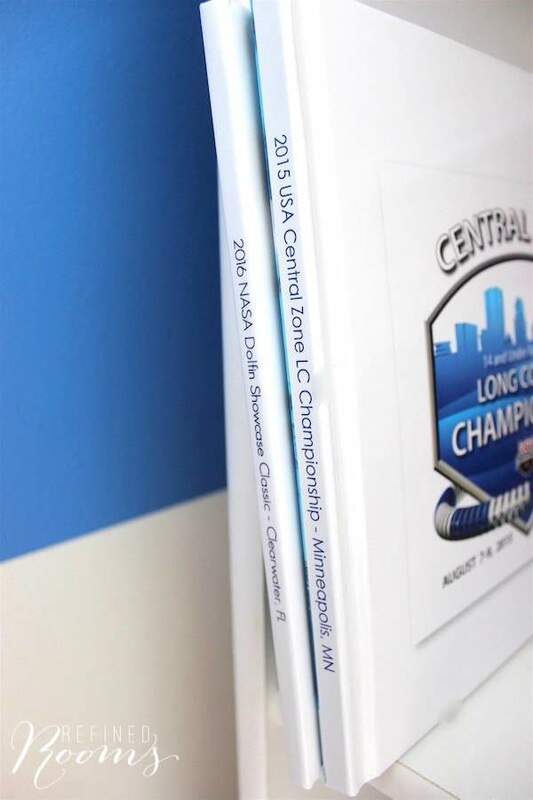 Alex keeps his books on a bookshelf in his room and really enjoys reliving special moments from each of these meets (swimming accomplishments, hanging out with great friends, and traveling to new parts of the country). 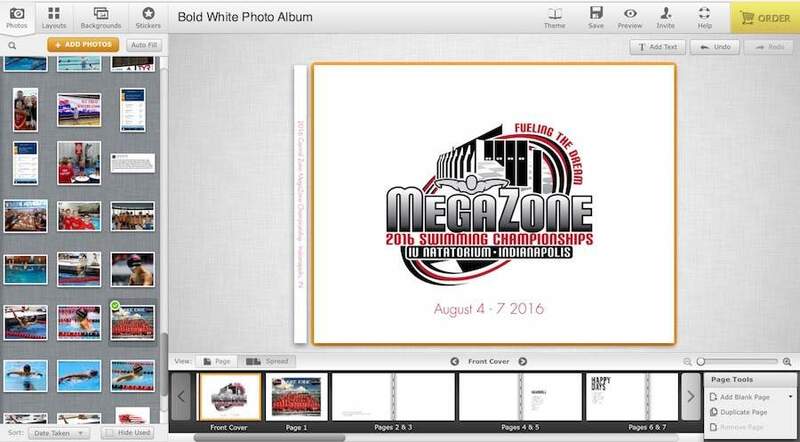 Since he’s turning 11 this month, I just completed a digital photo book of his recent trip to Indianapolis, where he competed in the MegaZones Championship meet. This meet was special for many reasons. It was the last meet he swam in the 9-10 age group. He brought home three MegaZones medals (one gold! ), and he had a blast hanging out with his swim buddies in a hotel for four days. So I was super excited to create this keepsake for him. There’s certainly more than one way to create a digital photo book. In fact, if you ask 10 people to document their workflow and the tools they used to create their book, you’ll likely get 10 unique methods to follow. Over the past few years (after much trial and error), I’ve honed in on a workflow and a set of tools that really works well for me. Hopefully, you’ll find it helpful as well. If you’ve completed the Digital Photo Organizing Challenge, you know that I store my digital photos in a central hub on my computer’s hard drive, using a core file structure to keep my photos organized. 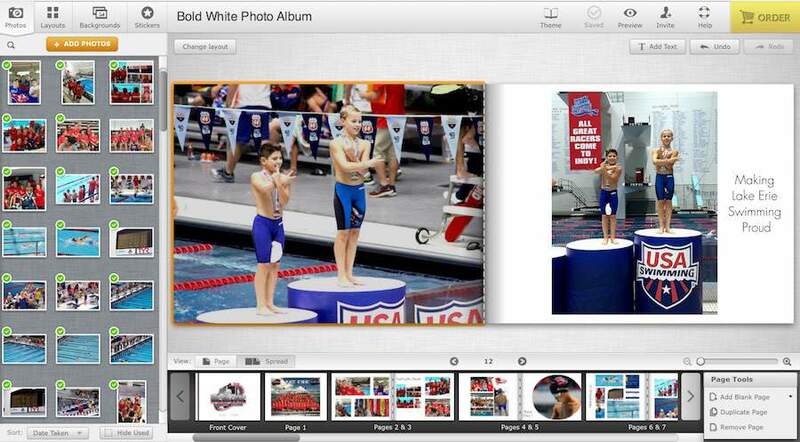 When it’s time to create a photo book, however, I find that photo organizing software can be super helpful. 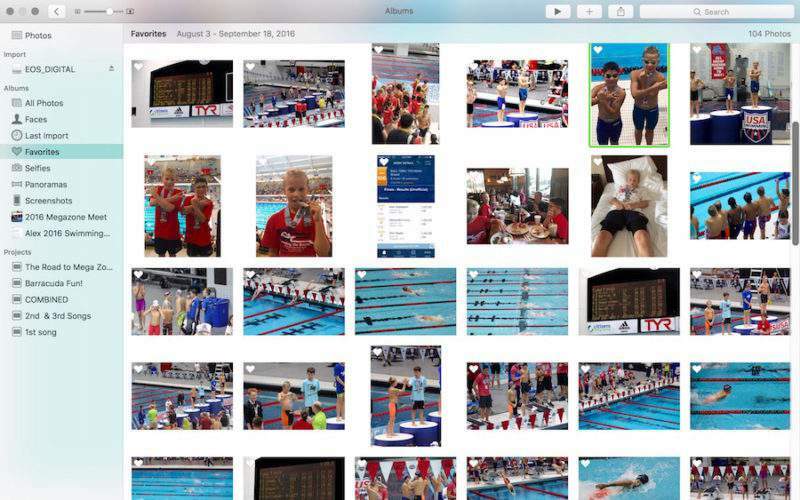 Since I’m a Mac user, I use Photos for Mac (the native photo organizing software that comes built into newer Mac computers, replacing iPhoto in recent years). I begin by importing all images from a specific event into Photos and then move them into an album that I create for the event (2016 Megazones Meet). Over the course of our 4 days at the MegaZones meet, you can see that I took 458 photos. The next step in the process is to whittle that number down and select only the “best of the best” to use in my photo book. 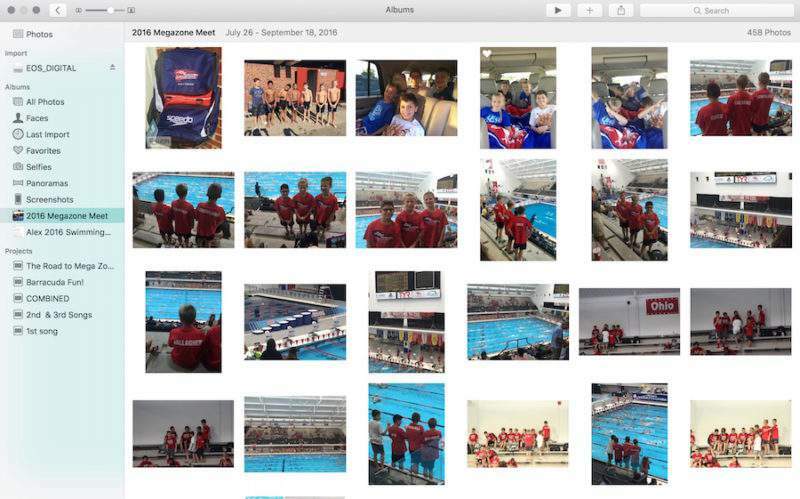 The Photos app enables you to quickly review your images (either one-by-one or in aggregate) and select a subgroup of images using the Favorites function. To tag a photo as a Favorite, you simply click on the heart in the upper left corner of the photo (a solid white heart indicates that you’ve tagged the image as a Favorite). During this stage of the process, my goal was to reduce the number of images to approximately 80-100, which I’ve found to be a manageable number when creating a digital photo book. I didn’t quite reach my goal in this instance, but 104 is much better than 458! Once I’ve whittled down the image collection, I create another album that contains just the images that I tagged as a Favorite to be included in the photo book. For this project, I named this second album MegaZones Photo Book. You can see above that this album contains only the 104 Favorites photos. Now comes the fun part (heh heh. Not really). Within the Photos App, I edit each image within this new folder as needed. My editing process typically consists of sharpening & brightening the image and adjusting the white balance. The amount of editing you’ll have to complete during this step will vary from project to project. 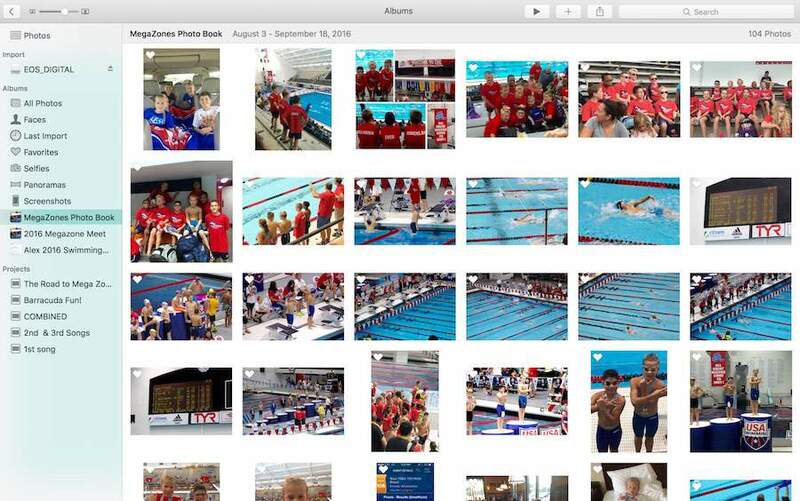 Since the natatorium where he swam didn’t have the best lighting, I had to manually correct almost every image. Even though most photo book software programs have editing capabilities within their platform, I find that the editing options are rather basic and cumbersome to use. I highly recommend editing your photos within a photo editing program BEFORE you upload the photos to the photo book site. 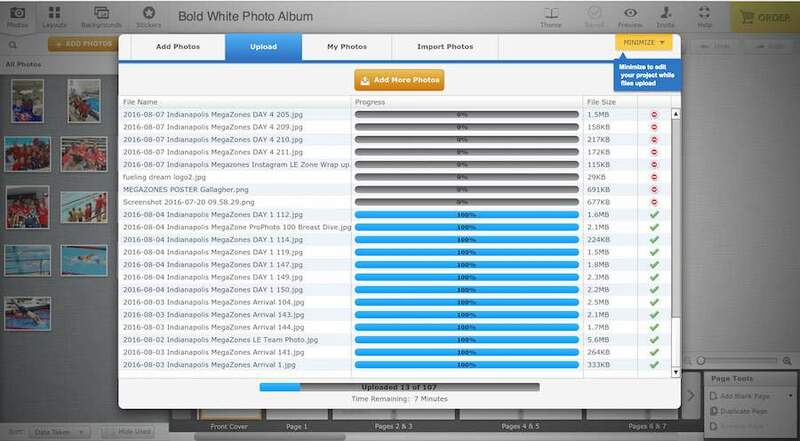 You’ll have more control over the editing process, and you’ll be able to edit the images much more quickly this way. Once you’ve edited your images, it’s time to export them out of the Photos app and into a new folder on your hard drive (I like to create a new folder on my computer desktop, but you can save this folder anywhere that makes sense to you). Be sure that you DO NOT export the images as “UNMODIFIED ORIGINALS”. If you do, you will have lost all of the changes you made during the editing process. At this point, you’ve got a single folder on your computer containing a set of edited images that you’ve earmarked for inclusion in your photo book. Yey! From this point forward, I’m going to walk you through how I create a photo book using my favorite digital photo book service — Mixbook. There are many services that you can use to create a gorgeous digital photo book, but NONE of them are as user-friendly as Mixbook. I used to be fickle when it came to photo book services, basing my choice on where I could find the best deal at the time I was creating the book. But the frustration I felt and the time I wasted attempting to navigate the design software when using other services was definitely NOT worth the few dollars I might have saved by using a service other than Mixbook. So now, I’m a customer for life! 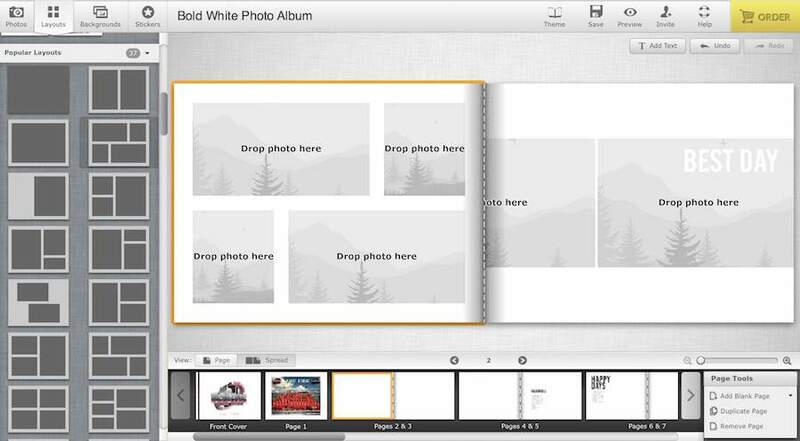 Once in Mixbook, I chose the option to create a photo book. 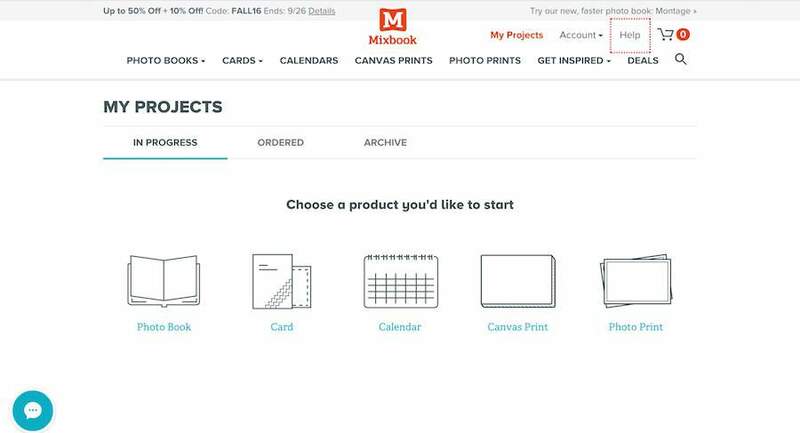 Mixbook offers a huge number of design theme choices. I tend to gravitate toward minimalist portfolio-style designs. If you prefer more of a traditional scrapbook design, you can incorporate embellishments to your heart’s content! 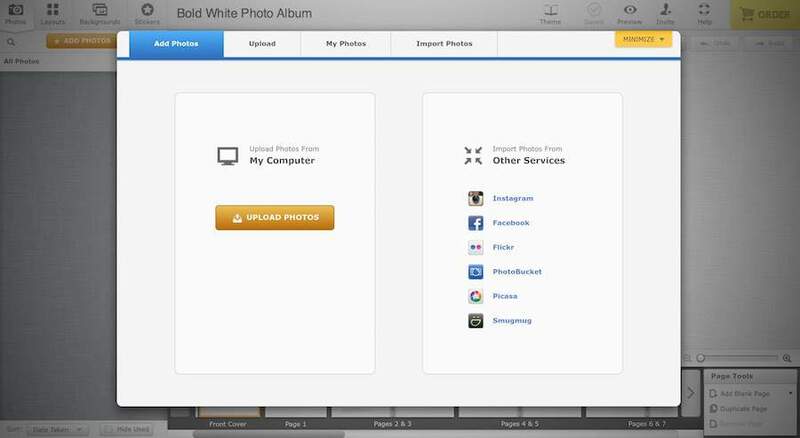 It’s really simple to upload your images into Mixbook. 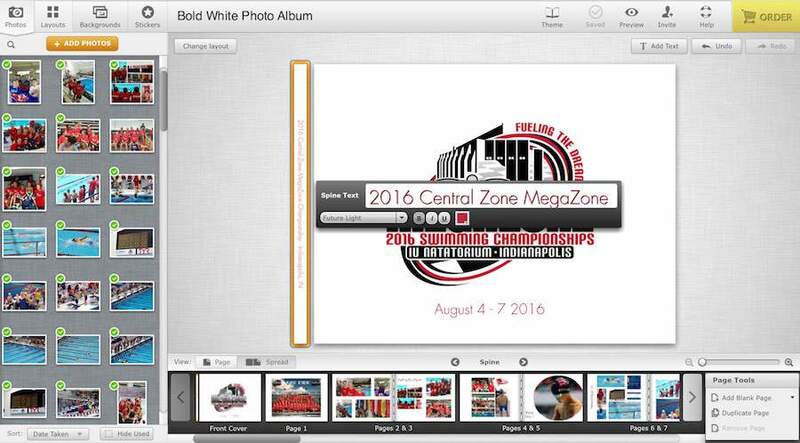 Remember that folder you created when you exported your images out of the Photos app? 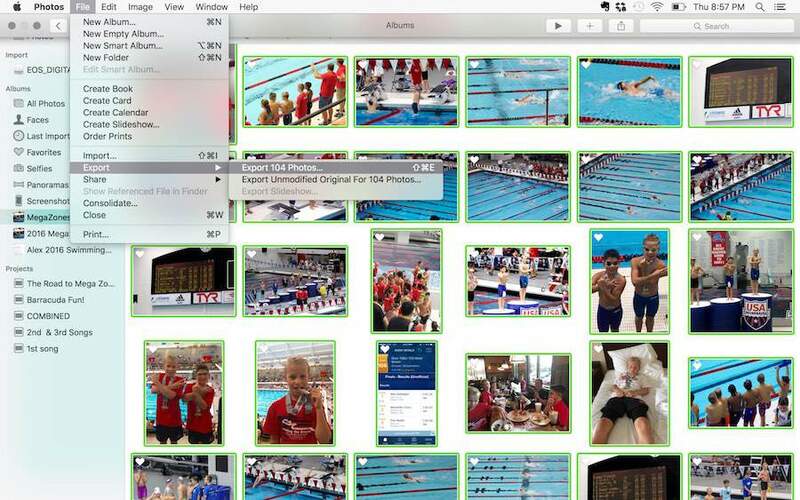 Simply navigate to that folder and hit the “Upload Photos” button. Once all of your images are uploaded, this is where it begins to get exciting! 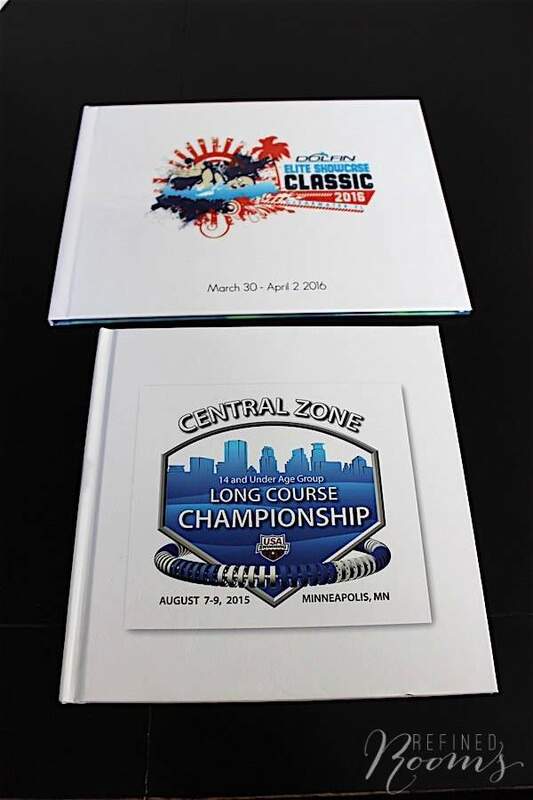 I like to “begin at the beginning” and design my album cover first (which is always the meet logo for these championship swim meet albums). The theme that I chose for this album (Bold White) comes with a pre-formatted layout for each page; however, I rarely use the pre-formatted layout. Instead, I like to create a custom design for each page, based on the number of photos I want to use on the page. With Mixbook, it’s super easy for me to make these custom layout changes. See those green check marks in the thumbnail image gallery above? They indicate that you’ve added those images in the book, so that you don’t have to keep track…another cool feature of Mixbook. Don’t forget to add a title on the spine of your photo book! 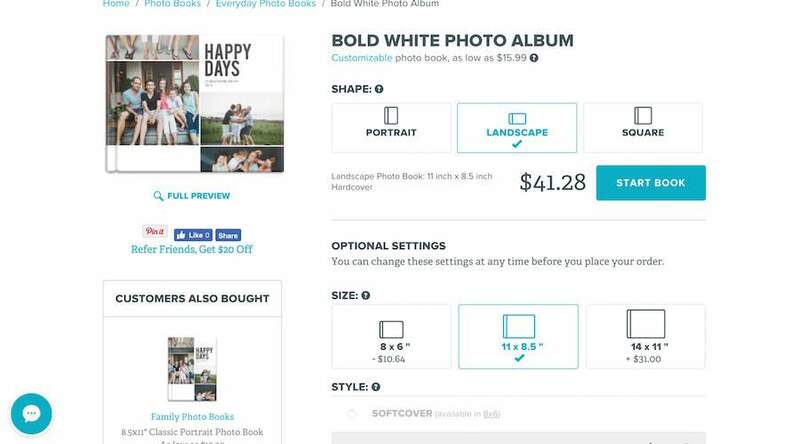 Virtually all of the photo book service websites offer you the opportunity to generate a preview of your photo book so that you can inspect it closely before making the purchase. Oftentimes, they’ll actually require you to check a box that you have reviewed it for errors before allowing you to purchase it. Take this opportunity to check for spelling errors and look for any design flaws. It’s also crucial to look for photos with low resolution (your design software will typically flag low resolution photos). This situation most often occurs when you are using a large image on a page. Oftentimes, you can simply reduce the size of the image so that the low resolution “warning flag” goes away. Don’t skip this step, or you’ll be disappointed to find grainy/pixelated images in your book. Mixbook runs weekly deals on their website, so I make sure to take advantage of the weekly coupon code (on the main page of their site) to get a discount on my book when it comes time to place the order. When I’m placing my order, I consider whether there’s someone else who might enjoy the photo book as a birthday or holiday gift. Since this particular book is specific to my son, I’ll just be ordering one copy this time. IF something were to happen to his book in the future, I love the fact that I could always reorder another copy of the book (which can be accessed in the My Projects folder in my Mixbook account). The hardest part of the entire photo book creation process is waiting for your book to arrive in the mail…which is what I’m doing now! So, have I convinced you to create your first digital photo book? If you’re already a fellow digital photo book lover, which photo book service is your favorite and why? FIRST ATTEMPT and your directions made it soooo clear, concise, and easy to follow!!!! Valuable step by step instructions and things to watch out. I am NOT tech savy, I kept your page open and carefully did the Mix Book process. THANK YOU VERY VERY MUCH I was able to capture special moments. This put a huge smile on my face Susan! I’m so glad that you found the tutorial easy to follow. Celebrating those memories is what it’s all about! I’m literally about to create a new photo book for my son’s upcoming birthday. Two years have past since I wrote this post and I follow the exact same method! This was very helpful, thanks – I’m creating large photo books for my daughters as they graduate from college, was looking for some guidance, and you certainly gave some good pointers! Many thanks. That makes me happy to hear Jack. What a labor of love!